Sharon High School’s library provides numerous resources for students. It is a convenient place for studying, finding information, and reading. Dr. Collins, the SHS librarian, described several of the supplies that are available to students. “Our library has so much to offer students! In addition to approximately 10,000 books, including many newer titles in both fiction and nonfiction, we also have magazines (75), Nooks, iPads, laptops, and a brand new Makerspace with resources including a 3D printer, electronics and robotics tools, art supplies, a Lego wall and green screen area with video production equipment,” Collins said. 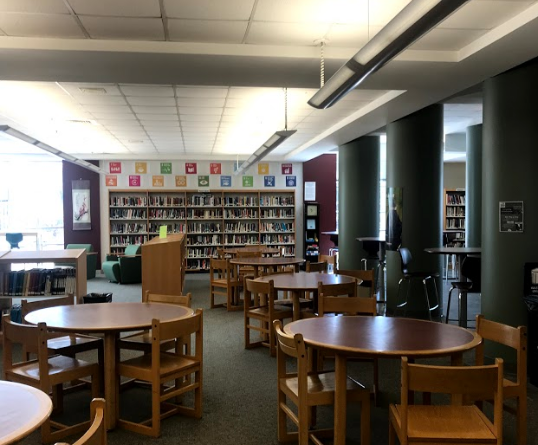 “When we renovated the room, we also added large cozy seating areas to make it a bright, comfortable space for students and staff,” Collins added. Freshman Avigayil Goldfeder says that she uses the library for studying and doing homework. “I use the desks and the chairs the most. It is a good place to study,” said Goldfeder. Goldfeder adds that she also uses the resources in the library for projects. “I have used the research materials in history class,” Goldfeder said. Dr. Collins adds that students can find a lot of information on the library website. “We provide students with an award-winning website which gives [them] access to college-level academic databases and other research tools, including pathfinders for specific research topics,” Collins said. Junior Riley Johnson explains that out of all the tools in the library, she uses the website most often. “I use the library database most often. It is very useful for projects because it provides reliable resources in many different types of media,” Johnson said. Johnson says that the library has many tools for research, especially for history. “I find the resources are most helpful for history classes because those are the classes [for which] you most likely have to find reliable resources. I typically use ABC Clio and Gale, but there are many more resources there that are available to [students],” Johnson said. Dr. Collins explains that the library is also a good place to host programs and club meetings. “We offer special programs and clubs ranging from ‘Bagels & Books’ and short story contests to this year’s district-wide Poetry Slam,” Collins said. Johnson says that she is a member of clubs connected to the library and even co-founded one of the clubs herself.“I participate in a lot of library-affiliated clubs. Rachel [Wachman] and I started ‘Books and Bagels’ our freshman year along with Dr. Collins, who helped facilitate and provided us the books that were then added to the library’s collection,” Johnson added. Dr. Collins also adds that the library is an important resource at Sharon High. “The library is truly a hub of our school, with lots of special events happening throughout the year,” Collins said. “We are open before school at 7:15 and stay open until 3:45 Monday through Thursday, and until 3:15 p.m. on Friday,” Collins added.